Whilst your Humble No Fenders Scribe is hopefully on thou Road, Headed Northwards from California ridin' shotgun with Tacoma Bureau Chief Mary Ellen, Pixie-the-Wonderdog; WUF-WUF! And Knock that Barking Off Silk! ARSE-Sumedly we'll be north of California's unbelievable Fire Destruction, notably from thou Santa Anna winds and thou terrible Thomas Fire, which Thankfully is now contained! As I-T came to Mwah, when posting that Saleen Whiteout post, just how many people know 'bout the proprietor of those wicked Fast Mustangs? And although Thars' a slew of Cool Cats from California, with the top three popping to mind being "Rocket Rick, Joe Cool" and Jimmy Johnson, the racing driver, Not Duh football Coach; Hya! While not sure how cool 'Ol Robby Dirtman' Gordoun (Gordon) is? What's Dat? You say what 'bout Jeffrey "Pretty-boy Floyd" Gordon? Uhm, although he's certainly Cool, and was born in Vallejo, CA; Oh Never Mind! But this meandering prose is supposed to be about a Californian from Inglewood, originally. Who's made quite the career by producing a bevy 'O Fire Breathin' specialty Aftermarket Signature vehicles, most notably FoMoCo's eponymous Mustang! Alas, it's funny, Ha-Ha! But when I thought about the man in Questione when beginning this elongated rant, I thought of his Championship winning Racetruck instead; Hya! Although I was always mildly intrigued by those Uber Narly Ford Ranger Racetrucks. Whilst how many people know he contested the 1989 Championship Auto Racing Teams (CART) season? For which ARSE-Sumedly, I saw him putterin' round the tail-end 'O grid at Portland? Otay, for those of Yuhs who haven't figured out who I'm ramblin' on 'bout, his name is Steve Saleen, albeit the picture should have given I-T away, Eh? First off, Messer Saleen finished third overall in Formula Atlantic in 1980, behind series champion Jacques Villeneuve and '79 Atlantic champion Tom Gloy, who missed three races due to having moved up to CART. Then after Rompin' thru Trans Am, Steve apparently ran just a partial CART campaign in '89, running a year old March 88C Cosworth under his own Saleen Auto Express banner, with a best finish of 12th at Toronto. Culminating in 31st Overall with a single point scored. And contrary to popular belief by thou, didn't race at Portland that year, which is odd since it would have been part of the West Coast swing, as Steve's first finish was 14th at Long Beach, while he failed to qualify at Indianapolis that year. As Saleen and another driver named Lazier, as in Buddy Lazier the eventual 1996 Indy 500 winner - both crashed on Day 3 of Qualifying, Saturday May 20th, with neither driver making "The Show." Yet my strongest memories of Saleen's racing efforts seem to revolve around the Saleen Allen R-R-R Speedlab Racing effort of '96, when he teamed with noted Comedian Tim Allen for that year's SCCA Pro Racing's World Challenge series, with some Ringer' known affectionately as Bondo', aka Bob Bondurant as Thar third team-mate. While my internal Stang' Hoof beats still fondly recall his pair of Awesome Saleen GT2 Class Mustangs run at Le Mans in '97 with wild running Horses motif - purposely running the numbers 66-67 in true Shelby lore. While I last followed Saleen's racing efforts in earnest in the early 2000's, when the Konrad Motorsports Saleen S7LM was always a factor at Circuit de la Sarthe. Alas, thanxs to my friend Rob, who introduced Mwah into the world of Ford Motor Company's (FoMoco') Total Performance era, and more specifically Carroll Shelby, and the modern day incarnation being the aforementioned Saleen, I first learned about Saleen's Mustang's in the early 1990's. As it became a yearly Summer tradition for Mwah, especially when ensconced in WASSAC', nee Washington Shelby Automobile Club, where I first got this writing bug... To attend the Mustang Roundup at Bellevue Community College, (BCC) where I stood in line and got Steve's autograph on that year's Saleen poster multiple times. 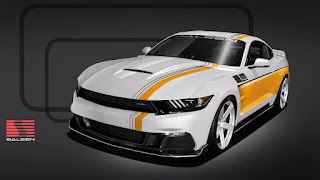 As the Saleen company has apparently gone thru its High's 'N lows, but is now once again under Steve's tutelage, as part of his latest venture SMS Supercars, with currently three BAD ARSE modern day Muscle cars on offer, the S302 Mustang, Black Label, S570 Challenger and S620 Camaro. Along with the electric GTX, apparently based upon a Tesla model. As it was nice to have been invited to the Saleen Mustang commemorative models Washington unveil this summer at Evergreen Ford Me Thinks, which unfortunately I couldn't attend. As even think the notice in the No Fenders Mailbox said that Desire Wilson would be Thar? Whilst Saleen's motto certainly is true: "Power in The Hands of A Few;" Beep-Beep!